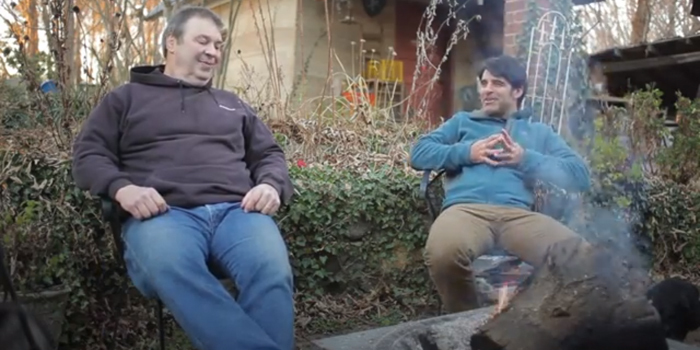 Web Exclusive: Bob Crawford, bassist for The Avett Brothers, and David Childers talk about making music in this mini-documentary. David Childers was featured in the May 2010 issue of Our State magazine. Below is an excerpt from that story written by Grant Britt. To David Childers, Hell is familiar territory. Childers and his band, the Modern Don Juans, got plenty of critical acclaim, but keeping the band going was a struggle. “A lot of critics liked it, [but that] doesn’t turn into money,” Childers says. Disillusioned with the business, Childers never lost his love for creating and performing music. Even as he was planning his exit, an ’07 Cleveland gig with Avett Brothers bassist Bob Crawford sitting in provided the impetus for his next musical project, Overmountain Men. The Overmountain Men’s second album, “The Next Best Thing,” is out now on iTunes and elsewhere.